So, remember those pods I planted a month ago? Here's how they're doing now. As you can see, it's growing amazingly well. 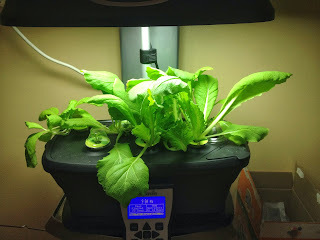 I was actually curious about what "Chinese Cabbage" was, as the Aerogarden site isn't too specific--there are at least two varieties of plants that go by that name, one being "pekinensis" (a.k.a. napa cabbage or white cabbage) and the other bring "chinensis" (a.k.a. bok choy). From what the leaves look like, it's pretty clear this is napa cabbage, which is great for us because we use it in cooking all the time. It's great stir-fried with pork, for example, as well as great for making dumplings, spring rolls, soup. Hopefully the garden will produce enough for us to cook all of them. I'll of course post recipes and pictures as I start harvesting (which unfortunately I have to figure out how to do, as the documentation from Aerogarden doesn't really help). And I really, really hope that I don't have to deal with bugs, at least for a while. 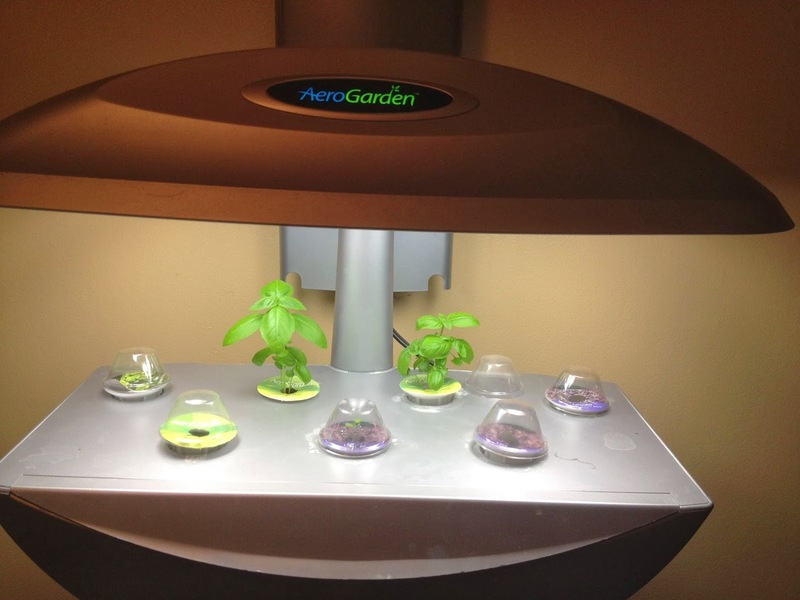 Here's the other Aerogarden with the herbs. What a difference. While the basil is doing well, as expected, none of other other pods are growing. And no, this time I don't want to deal with the trouble of trying to ask for replacement pods. I suppose this is par for the course with Aerogarden--some batches of seeds are just sitting around longer than others, so whether a pod will grow or not can be hit-or-miss. I attempted to salvage these pods by clearing out the bad seeds and the fuzzy mold that invariably grows around them and planting new seeds. We'll see if that helps. In other news, I got an email the other day that Miracle Gro is now an investor in AeroGrow. 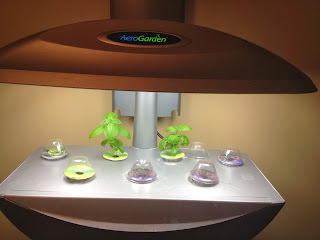 They didn't buy them outright, it seems, but they invested enough that all Aerogarden products are now being co-branded with the Miracle Gro logo. AERO's stock price has shot up to about $2.20 a share, small consolation for me who in 2011 exuberantly bought a bunch of shares at $5 and took a big loss when the stock became a penny stock--but good news for the future of the company--and for people who bought when it was a penny stock (yes, I know, if if's and but's were candy and nuts, we'd all have a Merry Xmas).